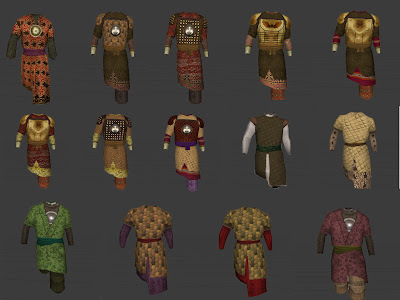 A new collection of mail, quilted and scale armors of Indo-Persian inspiration. Most of these are meant for the southern Indian kingdoms in Battle for Hindustan, but feel free to use them in your own mods! Just include me in the credits, and let me see some screenshots so I can enjoy your work too. Once again thanks for the response. I went ahead and used the insert as the copy and i did as you said with the instructions of adding the brf file and dropping all the meshes in the texture file and the changing of the id and meshes so that they would work, but when i started up a new game it keep saying that it couldnt find the new meshes. I made sure that all the id's was original and that the meshes was spelled correctly, but it still didnt work so I have no idea what im doing wrong. I figured this would be easier than when i was modding nwn, but I guess not. /shrug Thanks in advance if you decide to respond and tell me what im doing wrong. I'm working my way through various shaders with mixed results. nospecular_shader_noskin_bump_high is the best atm.